At my office I regularly represent people charged with Speeding and other traffic offenses in the low country. A traffic ticket contains important information and should be held onto. 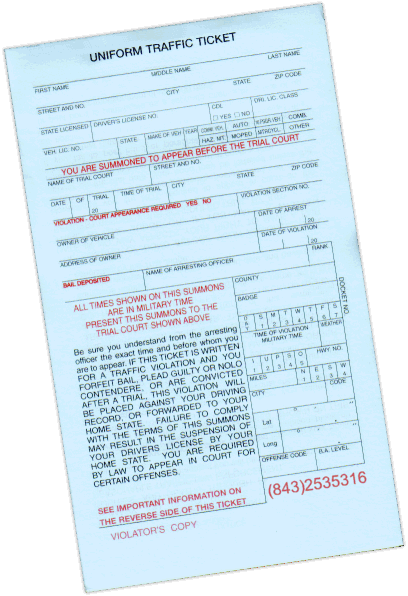 All tickets contain the court date, officer's name, court location, offense, and the person's relevant information. What most folks do not know is that if the ticket is a 2, 4, or 6 point ticket, the point amount is listed under "offense code" on the bottom right hand part of the ticket. The first number is how many points that ticket carries. For instance, a four point speeding ticket could say "41", a six "61", etc. If you have questions regarding a traffic ticket, DUI, or criminal case, contact me for more information. I can be reached at (843) 761-0610, at brady@vannoymurphy.com, or through the contact page on this website. Brady is a member of the South Carolina Association of Criminal Defense Lawyers and The National Association of Criminal Defense Lawyers. 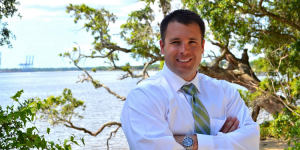 Brady defends DUI and criminal cases in Berkeley, Charleston, and Dorchester counties along with other areas of the South Carolina low country. He can be reached at (843) 761-0610 or through the contact page on this website.